Maharajas! The word maharaja, literally ‘great king’, conjures up a vision of splendor and magnificence. These princely rulers of India played an important role within a social and historical context and were patrons of the arts, both in India and Europe. That resulted in magnificent objects symbolic of royal status, power and identity. Here's a look at the opulent world of the maharajas and their extraordinarily rich culture thought their jewels. I have tried my best to attribute images to their creators and original sources. Please contact me if you know the source of images that are not attributed. Maharajah of Patiala, Yadavindra Singh. Patiala Necklace. 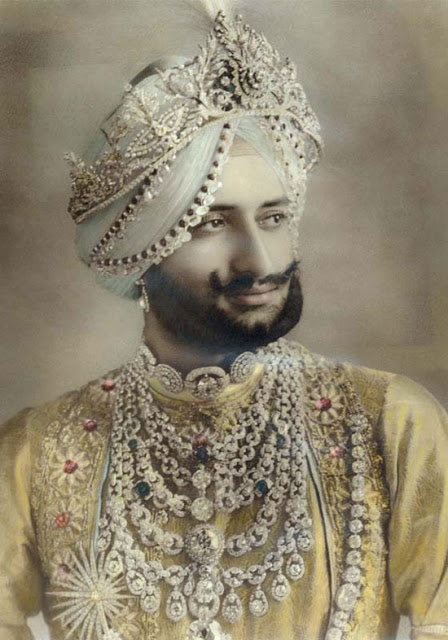 Maharajah of Patiala, Yadavindra Singh. Patiala Necklace. 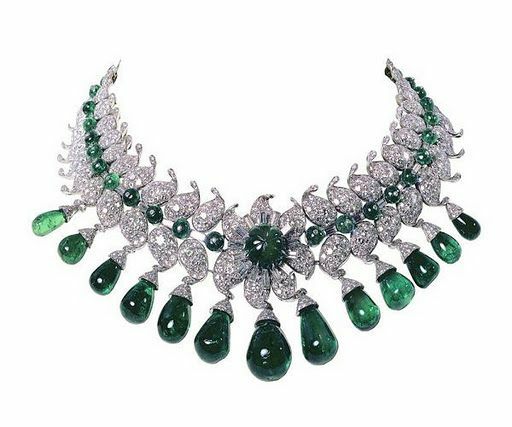 Weighing almost a 1000 carats, Patiala necklace was made for the Maharaja in 1928 by Cartier, the bib-like Art Deco necklace featured five rows of diamond-encrusted platinum chains and over-sized gems. It included as its centerpiece the famous De Beers diamond, a cushion-cut pale yellow diamond weighing 234.69 carats. Jacques Cartier with Indian gemstone merchants, 1911, Cartier Archives. Since his first trip to India, in 1911, Jacques Cartier (1884-1942) had become familiar with the extravagant tastes of the maharajas. Fabulously rich and passionate about precious stones, the Indian princes stopped at nothing to satisfy their perpetual appetite for jewels. 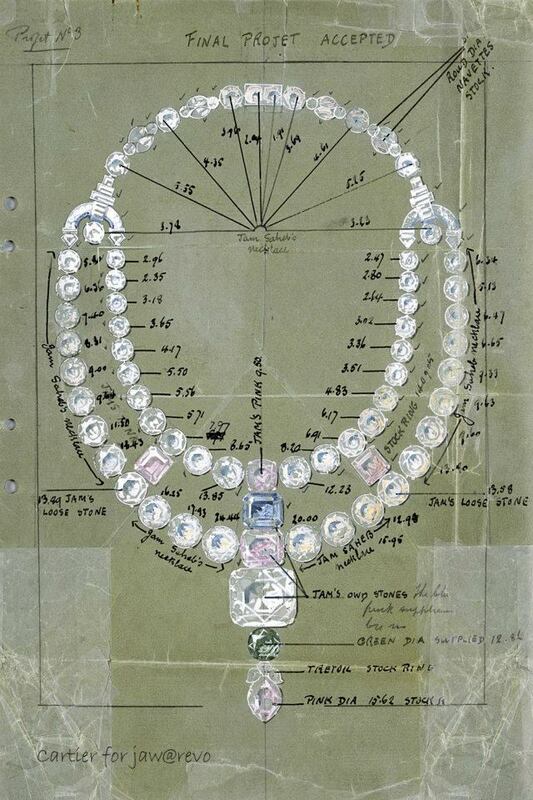 Drawing of the ceremonial necklace for the Maharajah of Nawanagar, 1931, London Cartier Archives. Jacques Cartier presented the Maharaja with a dazzling project. 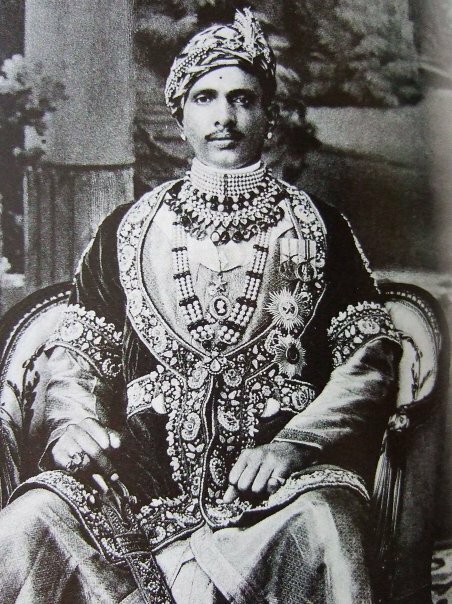 Sadly, the Maharaja of Nawanagar had little time to wear the “finest cascade of coloured diamonds in the World”. He died in 1933, two years after the necklace was delivered. The famous Baroda Diamond Necklace. 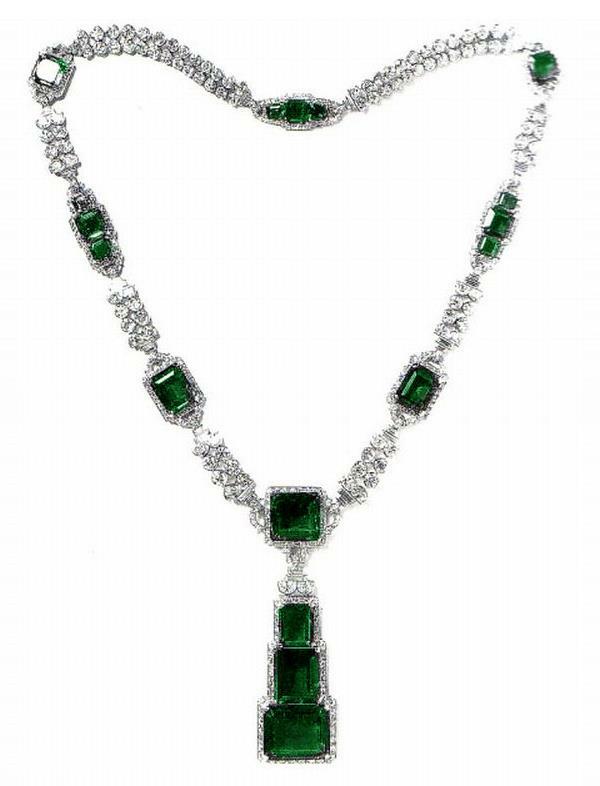 This magnificent ceremonial necklace with diamonds and emeralds was worn by the Maharaja (King) of Baroda, India in the 1860s. It was said to have been broken up in the 1940s to provide stones for anklets for the new Maharani (Queen) of Baroda, Sita Devi. 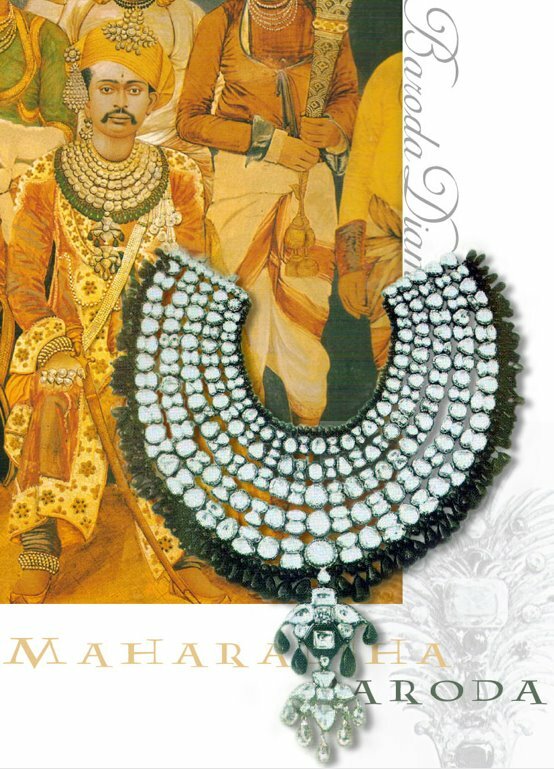 From The Treasury of Baroda - a magnificent three-tired diamond necklace, shown here worn by the Maharani of Baroda, Sita Devi in 1948. Khande Roe, Gaekwar of Baroda, had this necklace made to display two important diamonds - The 128.48-carat Star of the South (fancy light pinkish-brown) and the 78.5-carat English Dresden below it. Necklace photo: circa 1880. This breathtaking 61.50-carat whiskey-colored diamond, ‘The Eye of the Tiger’, was mounted by Cartier in a turban aigrette for the Maharaja of Nawanagar (India) in 1934. 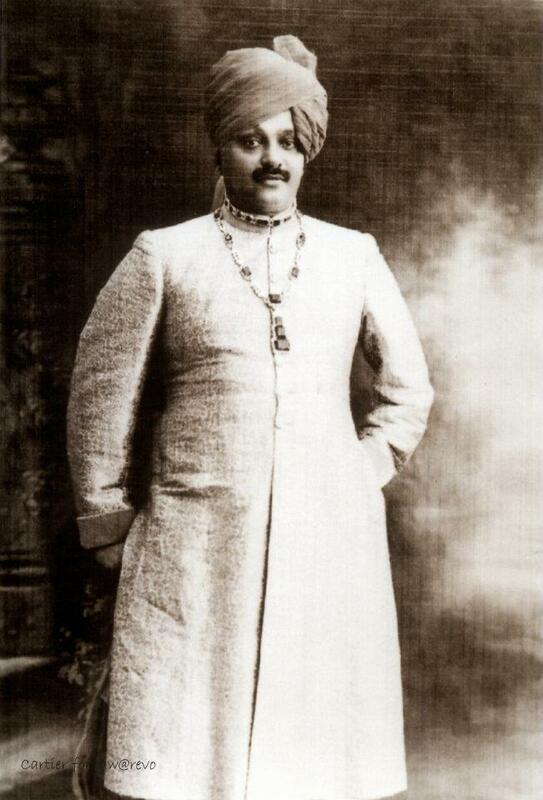 Maharaja Bhupendra Singh of Patiala. 1911. Wears an aigrette or Sarpech by Cartier and various other turban ornaments. While the front of aigrette is set with diamonds, rubies and emeralds, the back shows the intricacy of craftsmanship with foliate motifs of red, green and blue enamel. He also wears a necklace of fourteen strands of natural pearls. 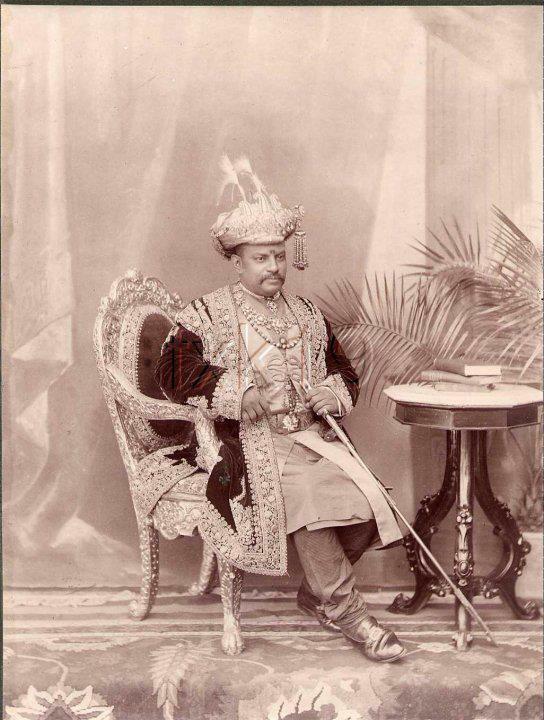 Bejeweled Maharaja of Mysore. © V&A Images/Victoria and Albert Museum, London. Bernard Boutet de Monvel, The Maharadjah (Maharaja) of Indore, Oil on canvas, 1933. 85 x 85 cm, Estimate : 300.000 – 500.000 € and sold in 2016 for €2,499,000. Image: Sotheby’s. Boutet de Monvel’s depiction of the Oxford-educated Maharajah of Indore, whose likeness was destined for the walls of Manik Bagh, his Indian palace. In this six-foot, stunningly ethereal composition from 1933, the young man, dressed in traditional costume, sits on a white throne against a pale background, the whole brought to vivid life by shots of shimmering colour: a garnet-hued turban on his head, two magnificent 47-carat diamonds (the Pears of Indore) around his neck, along with a luxurious fabric and a striped sabre scabbard at his feet. Bernard Boutet de Monvel, The Maharadjah (Maharaja) of Indore, Oil on canvas, 1933. 85 x 85 cm, Estimate : 300.000 – 500.000 € and sold in 2016 for €2,499,000. Image: Sotheby’s. 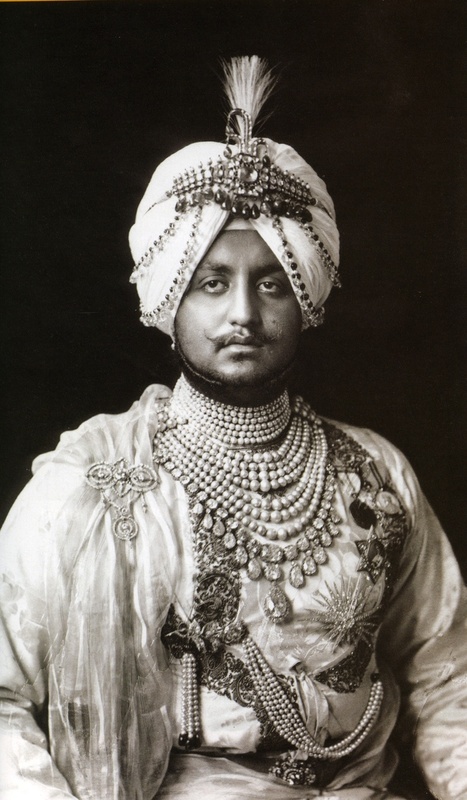 Maharaja is wearing two magnificent 47-carat diamonds (the Pears of Indore) around his neck. Maharaja Sawai Jai Singh Bahadur of Alwar, born 1882. Besides his traditional Indian ornaments, he wears the star insignia of the Indian orders granted to him by the British (Raj), then considered a part of the royal regalia. Maharaja Sayaiji-Roa, Gaekwar, Baroda. 1902. Wearing his famous seven row diamond necklace and other diamond ornaments. 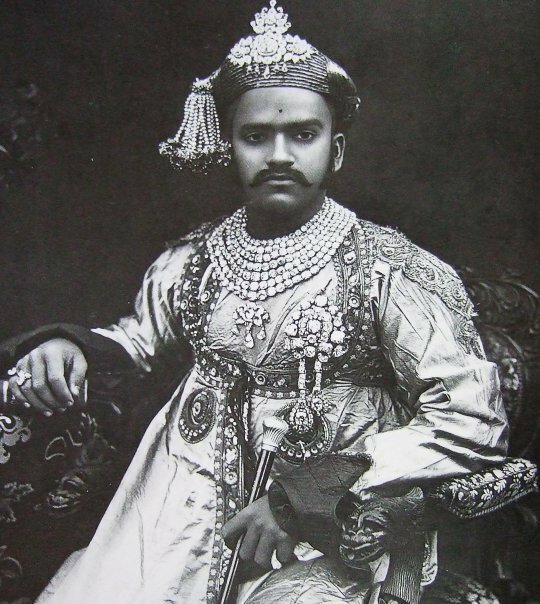 In the late 19th and early 20th centuries, virtually every Indian Maharaja commissioned state photographs of themselves wearing their most important jewelry as a symbol of their power and position. A cross cultural exchange. Miniature painting. National Gallery of Modern Art, New Delhi, India. 1902. Interpreted by an Indian artist (unknown), King Edward VII and Queen Alexandra, depicted as the King-Emperor and Queen-Empress of India. Raja Savant Singh and Bani Thani. 1780. Courtesy Spink and Sons Ltd. London. Kishengarh miniature painting, characterized by exaggerated profiles. Both with traditional Mughal-Rajput-style ornaments consisting of pearls, emeralds and rubies. 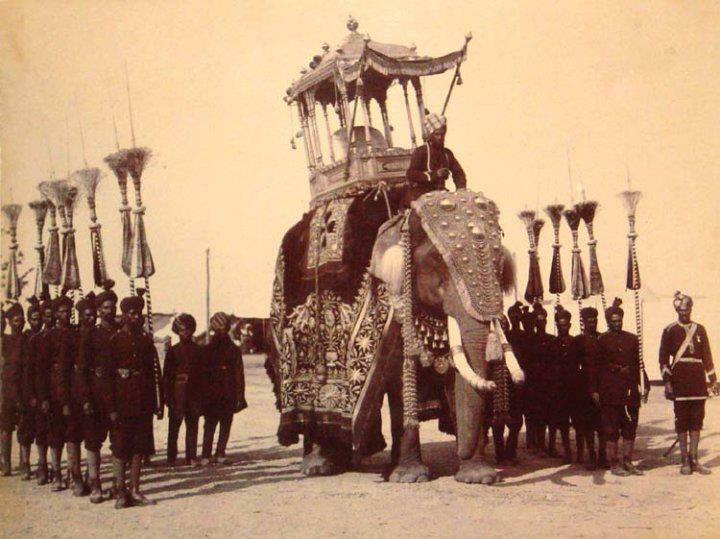 The state durbar decorated elephant, with attendants of the Maharaja of Mysore. Royal India. End of 19th century rendering by Chaumet staff designer, of a proposed ensemble of ornaments for the uniform of a Maharaja. 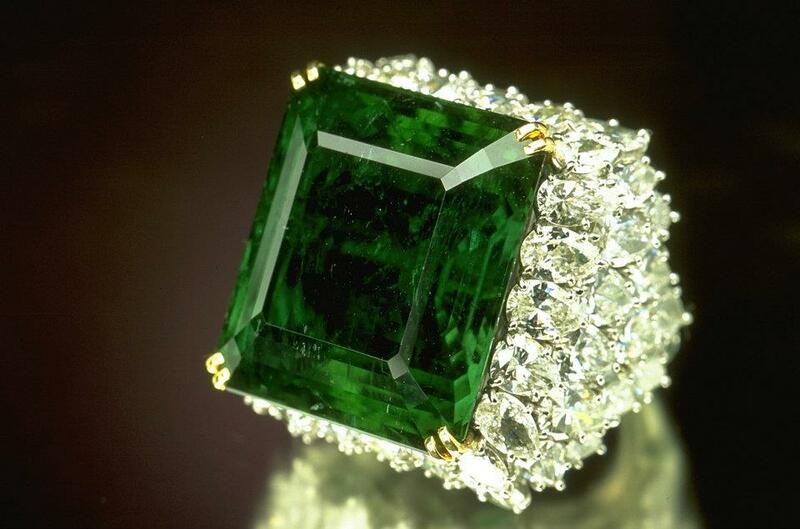 Rendering shows the use of diamonds, emeralds and pearls. Courtesy Chaumet. 1925. 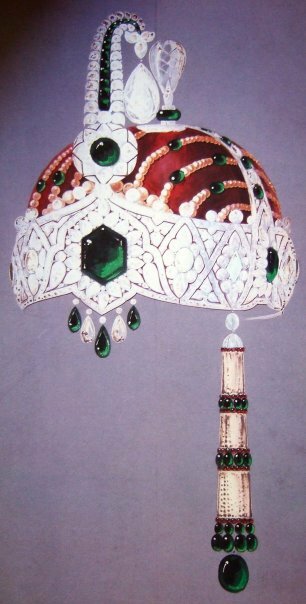 Rendering by Charles Jacqueau of Cartier for a headdress ornament for a turban, a project suggested by Maharaja of Kapurthala. Courtesy Cartier. Jade case, 1700-1800. Jade, rubies, emeralds, diamonds, steel. © V&A Images/Victoria and Albert Museum, London. 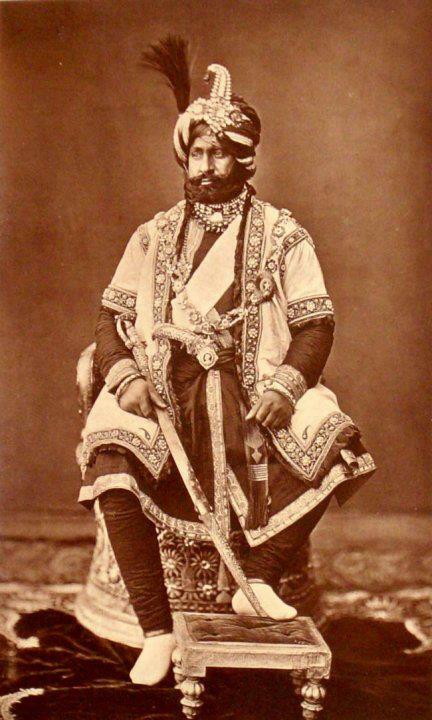 Maharaja Dilip Singh of Lahore. 1852. Portrait by George Beechy. Shown here at age fifteen. Amongst many other jewels, he is wearing a diamond Sarpech (Indian turban ornament) or aigrette with three plumes and a centrally placed emerald. Van Cleef & Arpels, Paris, 1949–50. The "Baroda Set" ordered by the Maharani of Baroda, “The Indian Wallis Simpson”, wife of the Maharaja of Baroda. This impressive suite of jewellery was designed by Jacques Arpels for Sita Devi, the second wife of Maharaja Pratapsinh Gaekwad of Baroda. It consists of 13 pear-shaped Colombian emeralds – 154 carats in total – suspended from diamonds set in the shape of a lotus flower. All the gems were all supplied by the Maharani and belonged to the Baroda Crown Jewels. Khande Roe, Gaekwar of Baroda, had this necklace made to display both the 128.48-carat "Star of the South" and the 78.5-carat "English Dresden" below it. Photo circa 1880. The Maharaja of Darbhanga. Royal India. The Maharaja of Alwar. (1882-1937). Royal India. 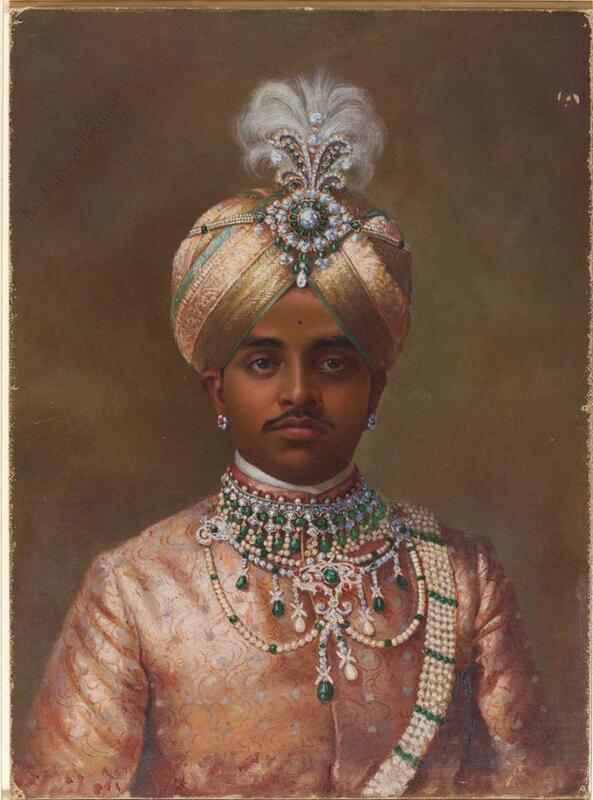 Maharajah of Nawanagar wearing the emerald and diamond necklace created by Cartier in 1926, Cartier Archives. The Maharana of Udaipur. Royal India. The Gaekwar of Baroda. Diamond necklace made to display both the 128.48-carat "Star of the South" and the 78.5-carat "English Dresden" below it. The Maharaja of Jammu & Kashmir. Royal India. Sprays of flowers turban jewel. Once belonged to the Maharaja of Jaipur. 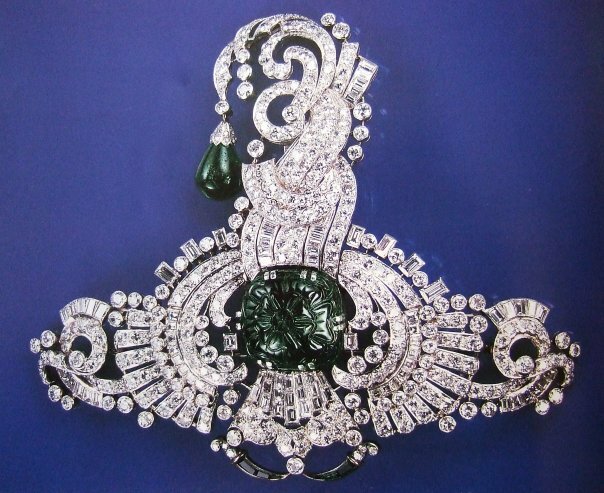 The aigrette is set with rubies, emeralds and pale beryls on one side, and the same stones with the addition of diamonds on the other. The stem and the sides of the jewel are enamelled in translucent green. 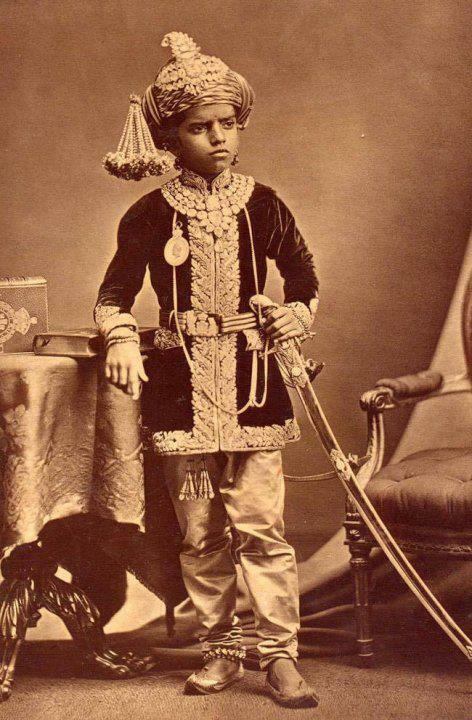 Prince, The Gaekwar of Baroda. Princely India. Diamond necklace made to display both the 128.48-carat "Star of the South" and the 78.5-carat "English Dresden" below it. Royal India.